It’s funny how you think you have your finger on the pulse when it comes to what’s happening in your end of the music scene and then something comes in with a great pedigree but it’s news to you. 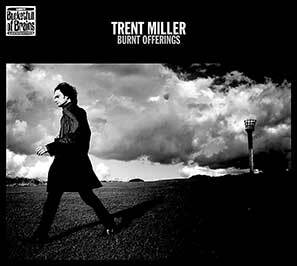 So it was when this album from Trent Miller, his third it appears, popped through the post and floored us. Imagine if you will an artist who has the romantic lyricism of Gene Clark, the LA voodoo of Jeffrey Lee Pierce and the retrospective roots appreciation of Richard Hawley. Picture a young Italian musician feverishly devouring tales and music of far away heroes as he scraps around for a living before eventually coming to London where he spends several more years scrapping around before some discerning folk lend an ear. That’s essentially the story of Trent Miller. From Turin, he couldn’t fill a phone box in his native land and it was only after several years of itinerant jobbing in London that he was able to release a home recorded album, Cerebus, which led to his signing by Bucketfull of Brains who fitted him up with a band and released Welcome To Inferno Valley in 2012 leading to critical acclaim. A raw boned collection of country tinged folk, Welcome To Inferno Valley had Miller’s sinewy voice set over a primarily acoustic band setting. Burnt Offerings continues in this vein for the most part but his voice sounds more assured while the music is less rustic and more arranged with a greater emphasis on electric guitar and pedal steel. Miller has an affinity with Gene Clark and the former Byrd’s spirit casts deep shadows on this album. Songs such as the title track and Pictures From A Different World have the literacy of Clarks’s song poems while the musicians hark back to the dappled sunlight picking of his late sixties forays into folk rock. Your Black Heart harks back to the sumptuous arrangements of Clark’s spell with the Gosdin Brothers while Sands Of Time sounds like a lost nugget from ’65. If this were all then one could dismiss the album as simply a (very fine) simulacrum of one of Miller’s heroes but he soaked up more than Clark in his dog days and he amalgamates his influences well here. Burnt Offerings opens the album with a loping rhythm and spectral guitar swoons that recall Lee Hazlewood as Miller sings of cathedrals in the desert. It’s hypnotic and beguiling. Lupita Dream sinks deeper into this dreamscape, lush and intoxicating it sounds like Jeffrey Lee Pierce wandering, stoned and immaculate as the guitars slide ecstatically by. The harmonica on Hearts On A Wire grounds the dream bringing it back to a back porch kitchen sink drama but before the listener has time to wallow in the comfort of the singer’s despair All These Violent Years slams into view. A metaphysical take on life and love with driving guitars, thumping drums and soaring vocals it’s somewhat of a tour de force leaving the listener exhausted afterwards. Sorrow Knows Better recalls another of Miller’s favourites, Guy Kyser of Thin White Rope with a sludgier sound and piercing guitars he almost steers into a piratical heavy metal shanty. Finally Miller dips a toe into the current guitar based psychedelic smorgasbord as epitomised by Israel Nash Gripka on On The Stone Beach which has the mystical Clark vibe and some very sweet fat guitar shining throughout the song. This entry was posted in Reviews and tagged Bucketfull of Brains, Gene Clark, Israel Nash Gripka, Jeffrey Lee Pierce, Trent Miller. Bookmark the permalink. ← Peter Mulvey. Silver Ladder. Signature Sounds.